I’m working on the first bona fide project on my little starter loom, which I intend to be a housewarming present for my friend Leigh. I was invited to a party at her loft Monday night with twenty-three other creative women, and everyone was supposed to bring a project. I brought this and let Leigh art direct it a little bit. We agreed it needs more brown and some orange, so I need to acquire a nice orange yarn. I didn’t ask her how she feels about fringe. 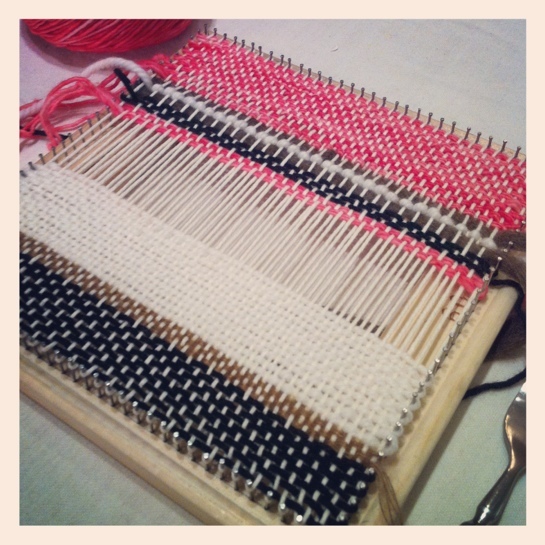 This entry was posted in Projects and tagged weaving. Bookmark the permalink. So pretty, can’t wait to see it finished!